P.S. I ran over my laptop. I ran over my laptop this week. Ran right over it with my car. I guess it could have been worse. I had 2 laptops, my Mac Air and my MacBook Pro in my bag. The Air wasn’t even touched. I’m using it right now to type this post. Here’s what the Pro looks like now. That white stripe down the right edge? Tire tread. Did you see my last post where I was talking about busy not being equal to important? Wasn’t I just making the point that we can slow down and in fact should slow down? I was headed out to my car after work and I had too much in my hands (metaphor, anyone?) . I set down my computer bag so that it was leaning against my rear driver-side wheel while I loaded the other stuff (like my favorite Prada handbag, a picture, my workout bag, my food bag; you know — workday detritus). Well, the next thing I remember is feeling this thump-thump — like going over a small speed bump or a cat (sorry, cat lovers; just trying to illustrate what it felt like). But I pull out of this parking spot all the time and I couldn’t recall there being a speed bump in that location. Heart sinks. Mind thinks: what did I just do? My mind was so busy because I am so important (ha! ), that I left my computer bag leaning against my tire. And then I ran over it. Crunch. Bye-bye, Pro. What was I thinking about in those moments that was so vital that I would forget about the most important item I was juggling (well, maybe a tie with the Prada)? I have no idea. It was just a dramatic version of misplacing your keys, or jumping into a pool with your smart phone in your pocket. Once the shock of what just happened began to fade, I saw the humor. And I saw it as the universe tapping me on the shoulder. Have you felt that tap-tap recently? Did it cause you to step back and look at a situation differently, and perhaps be open to different approaches? And when you want to see things from a different angle, do you have peers who can help? I knew a guy who did this on purpose when I was in KC. He hated his laptop but it wasn’t due to be refreshed for 18 months. He used it to “chock the tires while he changed the oil in his car”. He backed over it. It was destroyed. He got the new laptop and actually kept his job. Haha!! That is soo cool, Sara.. Exactly the same thump-thump thing happened to me this week. 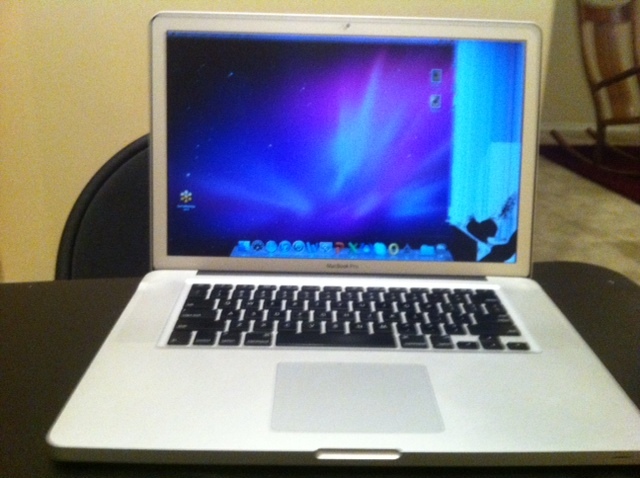 Ran over my MacBook twice (well yes.. “thump-thump (pause) thump-thump”) by accident. Guess what.. glass slightly broken, but that laptop still runs like a charm! Did it make me see things differently? Well, At least my screen does.. but from a more or less philosophical point of view, I suddenly realized that with this hectic life of mine, I’m starting to put others at risk. Today it is a pile of aluminum and circuit boards; what will it be tomorrow?